When I went to sit down and write this, I thought I had the words ready. 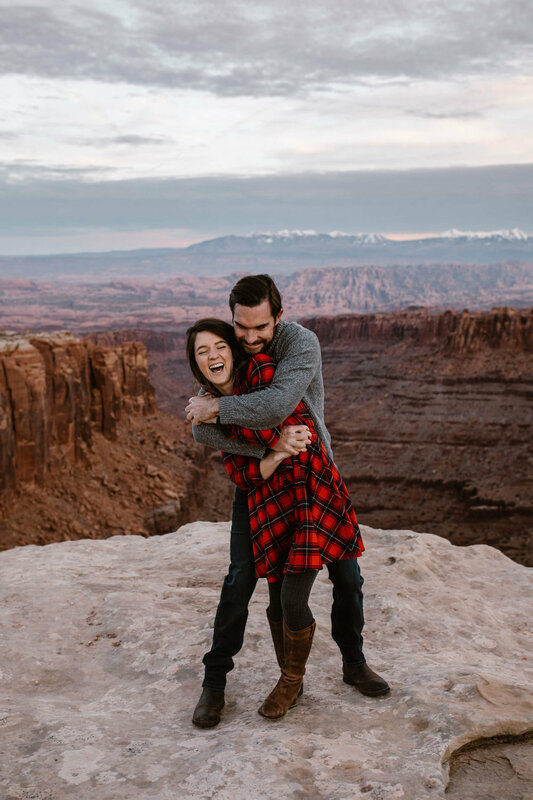 I was going to type out a story about this amazing engagement session I had with our friends Devyn and Adam in Moab. That task would be pretty easy, but I think the stories I get to tell, the words I get to put up here, are part of such a greater story, so today I want to tell that one. I want to tell the story I often only get to speak a little bit to. Really, this was an amazing session. The fall weather in Utah was changing to winter, giving us a new look and feel to shoot. 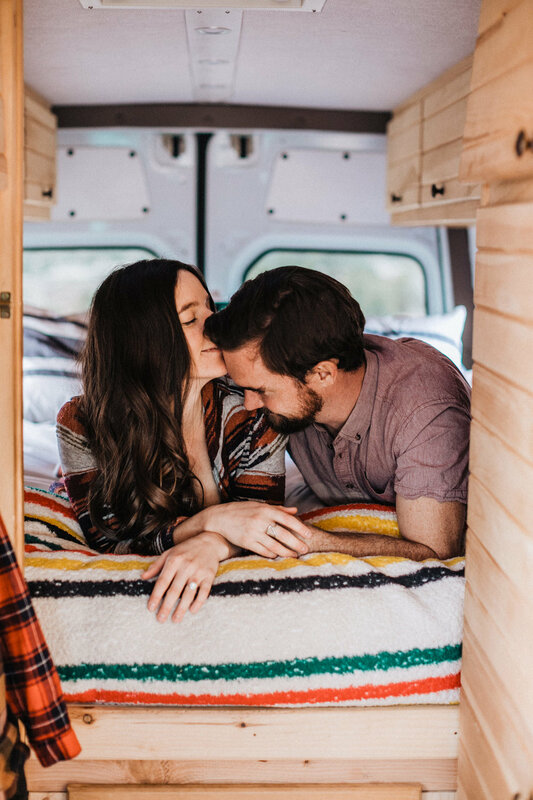 We brought along the favorite Pendleton Blanket, packed the flannel, and put on favorite sweatshirts. Everything was cozy, and Adam and Devyn were beautiful. But there's always so much more to our couples than the shoot. What I do in images and the words I write here are just parallels to what already exists. So, as I typed out the words I had planned, my mind kept floating to the parallels - the things which make our couples gravitate towards wild places, plan adventure elopements, fly to Yosemite to get married, walk in suits and dresses through freezing cold water in Alaska, hike miles upon miles to their ceremony in Zion, and wear boots with their dresses which look better with a little trail dust. My mind kept thinking "with"... we do this with each other. The reason why all this looks so natural is simple because it is. We're just out here doing what we love to do with each other. There's often a sense that we're doing something really special, acting as conspirators of adventure and extravagant love, making memories like we are neighbors with years of friendship under our belts. And when I think of Adam and Devyn's shoot, when I was writing it out, I kept thinking neighbor because that's what they've been to us. 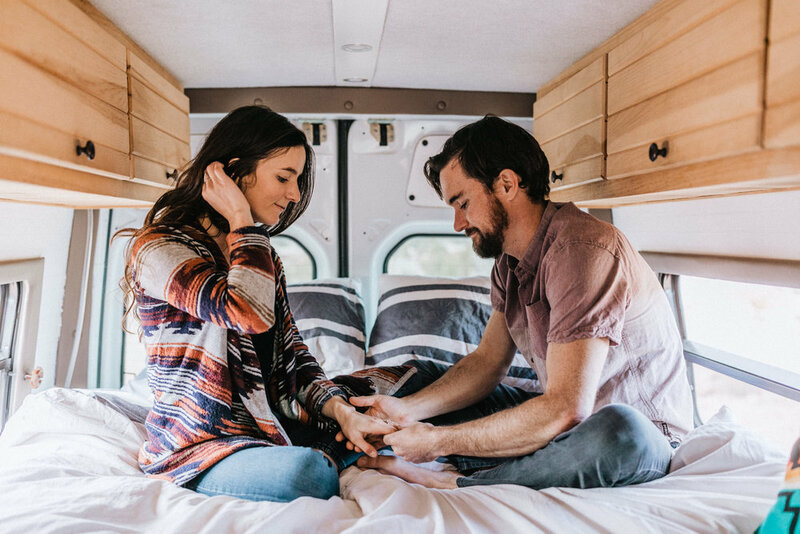 We met when Devyn saw we were in town insta-messaged me "I’m making dinner in the van, want to come over and be friends?". That's how it all started, what led to so many stories and this amazing friendship. 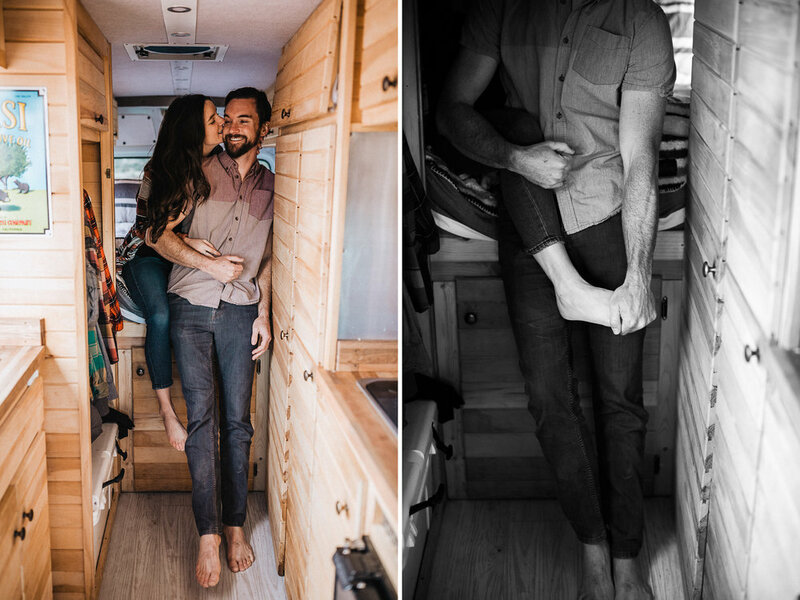 We started their shoot in their van, music playing, Adam and Devyn getting food ready. I thought about how the charcuterie board they were making was one of so many times we've sat as they prepared something for us (and filled up glasses of wine for everyone). The picnic was one of so many times we sat across from them, laughed, talked, and watched the sunset over our favorite desert. The staring out at towers, talks of climbing them, Charlie getting in the way of absolutely everything, seeing Adam smile and hug Devyn - it was all just one of so many times we've done and will do this. 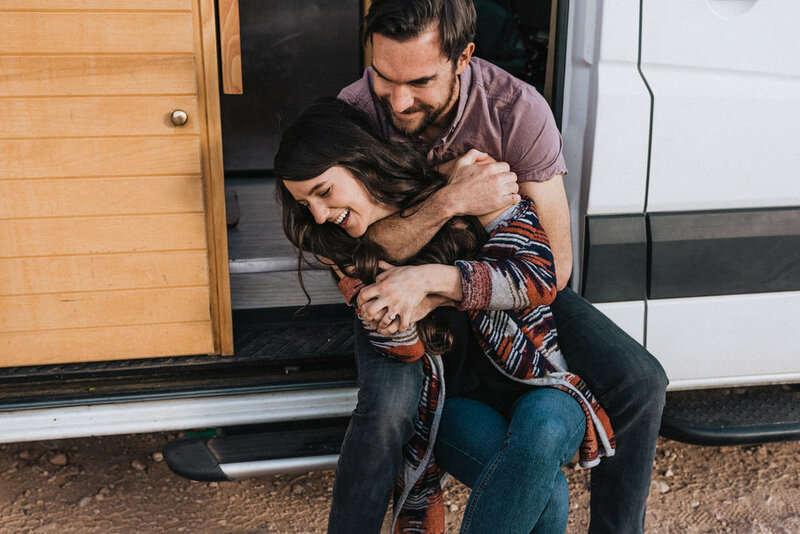 Sure, it was a little different than normal as Devyn insisted she "put on fancy clothes" this time - a dress from KJP and Frye boots, but she and Adam make vanlife look good all the time tbh, I just don't always take pictures of them like this. 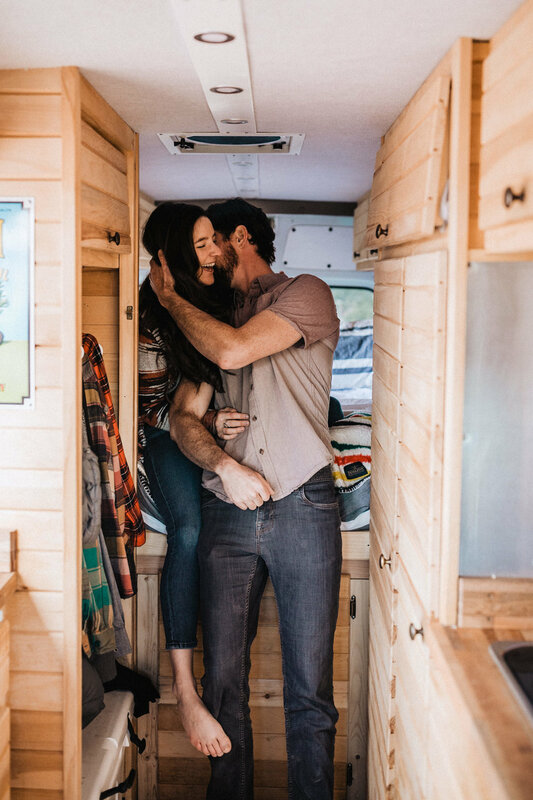 I have taken their picture before though, if you ever come in the camper it's one of the many Polaroids hanging on our fridge. It's stuck up with tape right alongside a bunch of other friends - Bri and Keith, Tommy and Becca, Jordan, Travis. 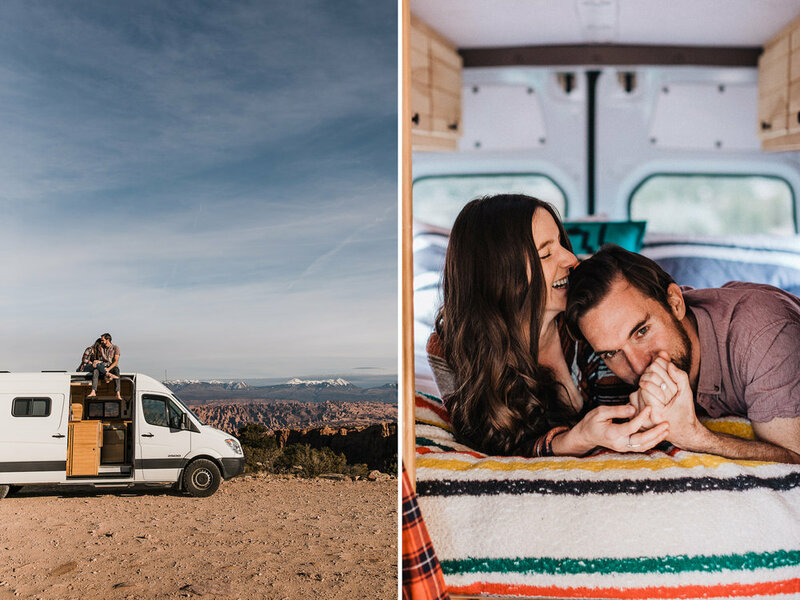 They've all been there belaying on Wall Street, climbing routes in Mexico or up El Cap (Callen + Jordan exclusive, not me), cooking dinner, texting about plans, encouraging each other, pushing me to send routes in Moab and take risks with our business. They've been there for late night conversations and early morning coffees and rallied as we cross country skied to a yurt and trekked it back in a foot of fresh snow. Their friendship is the deep, meaningful, lasting kind. The kind that's the same to you as it is to your friends, like a thread that weaves everything and everyone together. 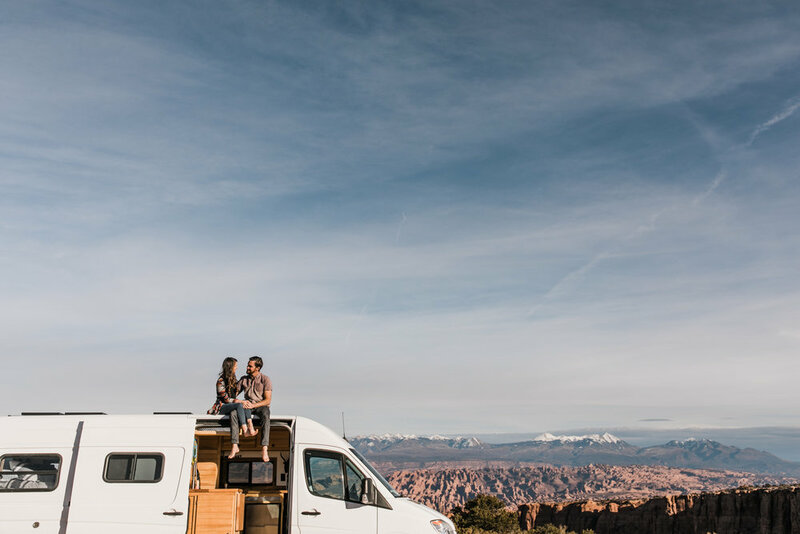 They've been coming to Moab for years already, are part of this little mob of nomad friends we have who we caravan around through states West of the Rockies. These photos are just a piece of the adventure. Pictures are meant to do what they did with these two - bring back a thousand memories for each photo - memories of Friendsgiving and $5 burgers at McStiff's, of lame Christmas tree lightings that turn into hot chocolate movie nights, of all of us stuffed into the camper to watch Indiana Jones. They'll be there in all the following years of adventures too. Typically, it's our clients who become friends, but this shoot was a little unique because it was our friends who became clients. What we did was just what we've done, what we'll always do, what we look forward to and what we've got a lot more coming. I remember this type of thing is just the best version of what I get to do all the time. I know every couple we shoot, everyone we become friends with, all have their mountains and deserts of friends. It speaks towards the type of people we get to love on, the adventures we get to have, the type of world we're getting to make and capture... and honestly, it just makes me excited about the future. We're so grateful for all this, every happy thing we get, every friend we make. We're excited about future road trips and beers around desert campfires. Excited for sufferfests, debates about movies, and tower sends with our buddy Jordan. Excited for texting plans and chance meet ups. For warmer weather and sitting in rivers with Bri and Keith. We'll hang out with Travis again and talk about hopes and dreams. I think about how special this is, to not just be capturing stories, but creating them. When I sat down to write this, I thought I had the words I wanted to say about Devyn and Adam, but I realized I was just opening a book that already existed, one with a worn out spine and hundreds of underlined sentences. It's a book filled with dog eared pages for when I need to go back and re-read some parts. It's one of my favorite stories. I'm so glad to know there are so many chapters we've got left to live, characters we'll love that we don't even know yet, ones we'll show these pictures and tell stories to. So ya, this was the honest post about this session; one that speaks a truth towards the story all my clients/friends have going on. 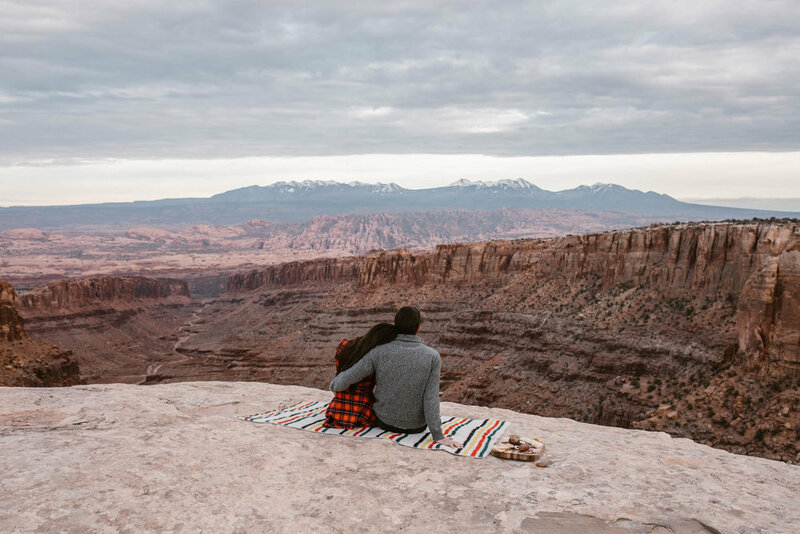 It's the truth that shows these pictures aren't stand alone images, but ones that fit inside a book we've all got going on - visuals like bookmarks between pages about love and adventure. We might not always be neighbors, but we've always got this story to pull off the shelf, stories to reread about adventures that brought us together and, of course, the million blank pages ahead. It's all my favorite part. Every single picture. Every last word. The Hearnes Adventure Photography is run by Abbi and Callen Hearne, a husband & wife wedding photography team with an emphasis on adventure. 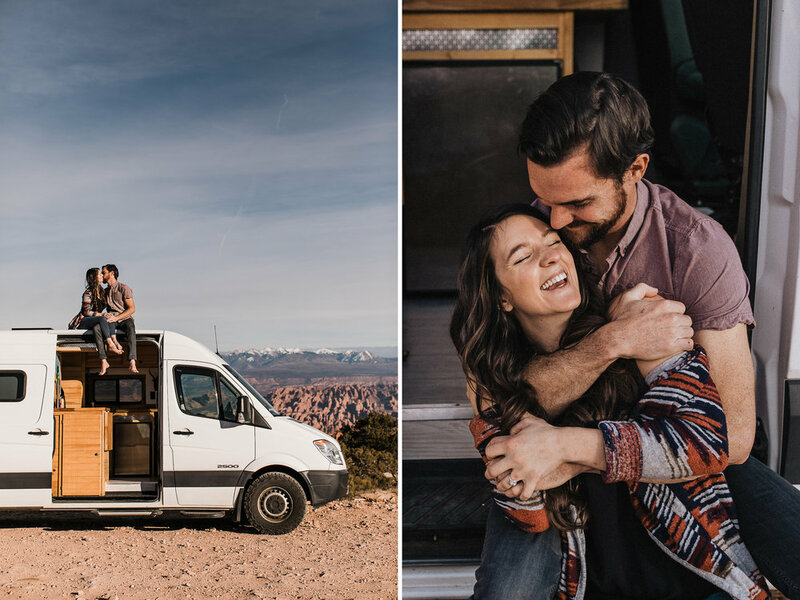 They live on the road as full-time nomads, allowing them to serve a large portion of the western US. 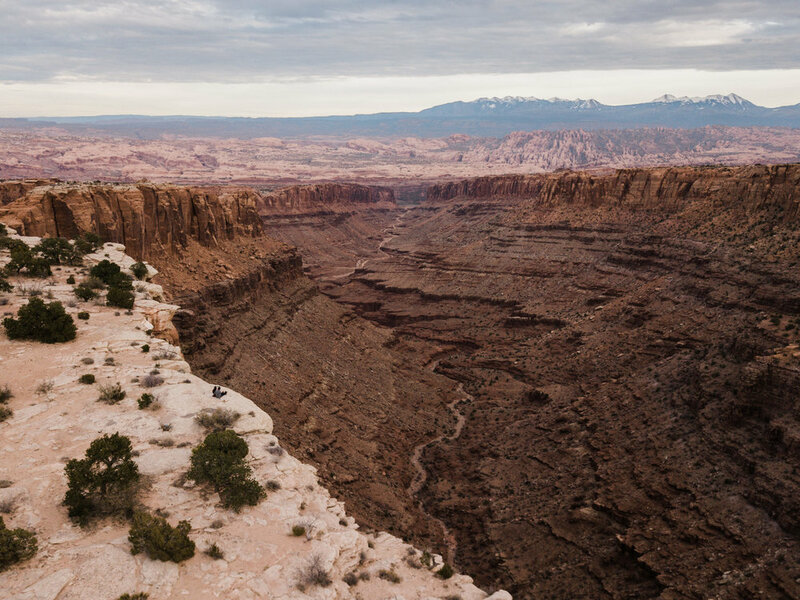 You can typically find them in Moab, Utah or Yosemite National Park, California, with side-quests to Patagonia and Alaska. They believe love is the greatest adventure and strive to create photos that are epic, romantic, true, and timeless.